Someone recently asked me to post something about San Francisco as habitat and place — it was suggested that “context” would be of interest to people not living here. What a great idea! I’ve basically done this with a few telling photos which I’ve divided up into the subdivisions below, beginning with the Google map which you can zoom in on, then aerial photos, then downtown and then the neighborhoods, parks and coyotes. In a nutshell, San Francisco is a 49-square-mile peninsula connected to land only in the south. It is known for its hills and for its flat dune areas. It has a desert climate, with rains in the winter and spring, and then months of no rain at all. We’ve had drought years with very little rain at all. The vegetation is that of a desert climate, but we have vegetation and many tree varieties which were brought in over a hundred years ago, including Eucalyptus, which have become naturalized habitat for all sorts of wildlife. Human population officially is only about 860,000, but San Francisco serves a much wider area of about eight million people. It’s actually the 13th most densely populated city in the US. Take a look! Because of being on the coast and having fog, the weather in San Francisco is very mild, with temperatures averaging in the 50-60-70s. However, we’ve had snow a couple of times that I remember, and I remember the day it got to 104 degrees — these extremes are RARE! AERIAL VIEWS OF THE CITY below include, first, a view SE from the Presidio, near the Golden Gate Bride, and second, a look east and slightly north from the middle of Golden Gate Park. These show a high-rise downtown area in the NE corner of San Francisco, a very hilly central part of the city, and flat dunes in the western section, which includes Golden Gate Park and access to the ocean beaches. SAN FRANCISCO PARKS, like those shown below, offer excellent habitat for coyotes. The nativists of the city are bent on removing this growth in favor of desert scrub, but the vast majority of San Franciscans love the existing growth that has become naturalized in the city, including the fabulous Eucalyptus, and they are battling to preserve it. COYOTES are out and about — usually when humans are not or when humans are sparse. We have several dozen in the city. Although they shy away from people, they’ll give territorial messages to dogs, and small pets may look like any other prey to them: Always keep your distance from a coyote — it’s to make them and you feel safer. If you spot a coyote while walking your dog, tighten your leash and go the other way. 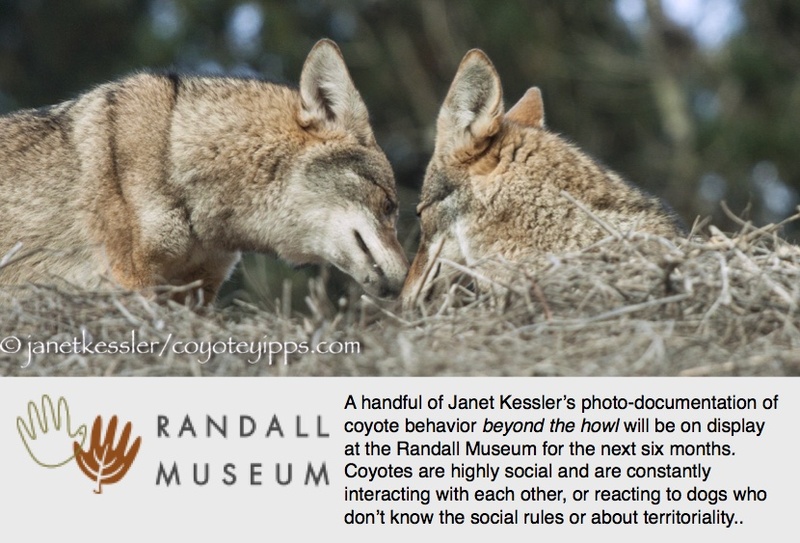 See How To Handle A Coyote Encounter: A Primer.